Largest Cv value, combined with high rangeability. Cage guided balanced plug for smooth operation. Variety of cage designs to handle gas and liquid critical applications. Drive mechanism’s multiplier effect give maximum thrust when it is needed. Unique Rotary-to-Linear drive mechanism simplifies actuator requirements. Standard electric or pneumatic 90o actuator with standard positioner can be used. – Smooth, precise control. Environmentally safe: Low emissions due to rotating shaft. Drive mechanism is not affected by dirty fluids. Reduced force requirements by more than half. Higher capacity in the market for same sizes, over 30% in on-off valves. Trim materials can be supplied with claddings and overlay, such as Stellite, Tungsten Carbide, Chromium Carbine, Inconel. For choke applications, integral sintered Tungsten Carbide trims are available. Cr + Ni Stainless steels: Alloy 20, A351-CK3MCuN Duplex A890-Gr. 4A, Super Duplex A890-Gr. 6A Nickel based alloys, Hastelloy, Inconel; Monel. Titanium. Cr + Ni Stainless steels: Alloy 20, A182-F44 Duplex A182-F51, Super Duplex A182-F55 Nickel based alloys, Hastelloy, Inconel. Stellite: Hardness HRC 45 RC & Maximum working temperature 500ºC. Tungsten carbide: Hardness HRC 74 RC & Maximum working temperature 550ºC. Chromium carbide: Hardness HRC 68 RC & Maximum working temperature 870ºC. Inconel: Hardness HRC 23 RC & Maximum working temperature 700ºC. For choke applications or where high hardness is required (dirty fluids with particles). Produced by sinterization. A streamlined body with constant sectional area, offers a very reduced coefficient resistance and gives larger Cv values for the same sizes. Fluid is channeled into an annular path between the inner and outer bodies until it reaches the characterized cage. Smooth changes in flow direction and no turbulences contribute to lower noise levels. The high capacity, combined with the large rangeability, make our axial valve to be acknowledged as the ideal design to control over the full range of process conditions with a single valve. As an option extended body neck is offered for cryogenic operations. Low emission is guaranteed by the O-ring seals combined with back-up packing. Distance between flanges is in accordance with ISA 75.03 when data are available or API 6D for larger sizes. Actuator flanges are machined according to ISO 5211 or other standards. All types of quarter turn actuator are easily mounted. Casted range from 4” to 48” and ratings from 150# to 2500#. Forged three pieces for sizes below 4” and pressures above 2500#. Constant flow passage area ensures the maximum possible capacity for on-off application due to reduction of the K resistance coefficient. Can be used for on-off application without cage in order to achieve high capacity. Control is performed by hole pattern. 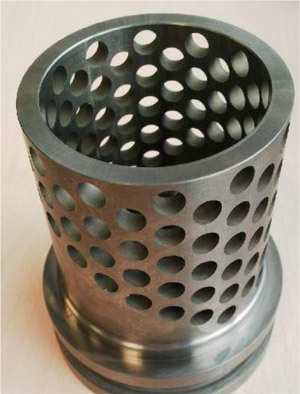 Possibility of using multi-cage designs to perform multistage pressure reduction of high noise/cavitation conditions. Availability of balanced plugs, to reduce the required actuator torque. The inner chamber, wich includes the transmission system is pressure balanced, due to that no fluid movement is occurring inside this area. 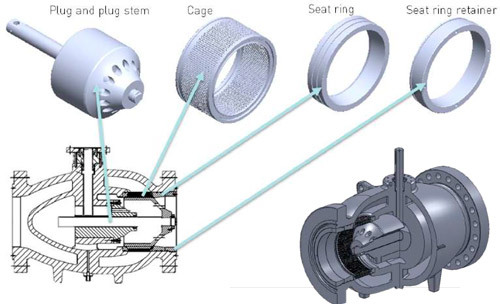 Bearings of transmission mechanism are protected against particles by a cover. Multiplier effect reduces force torque and actuator size. It is not affected by dirt, impurities or fluid conditions. No gap, low friction bushings in crank and rod junctions assure a smooth, no backlash movement of the plug. The drive mechanism is designed to multiply the actuator force applied to the plug when it is needed. This feature makes it possible to select lower torque, smaller size actuator and reduce operating times. Additionally it improves the valve inherent rangeability. At the beginning of the opening a large angle of rotation means a small change in the stroke of the plug. Good for start-up conditions with small cv values. All together it combines to give smooth, accurate fast operation of the valve with smaller size actuator and enhanced ran- geability. Low friction sealing of rotating shaft. Low friction bearings in the transmission of movement, from shaft to plug stem. Plug, guided by the stem is fully balanced in both axial and radial directions and gives no friction to cage. Multiplier effect that reduces the required actuation force. Maximum force is delivered when it is most needed at opening and closing. All the above combine to greatly reduce the torque, the size of the actuator and the operating time. 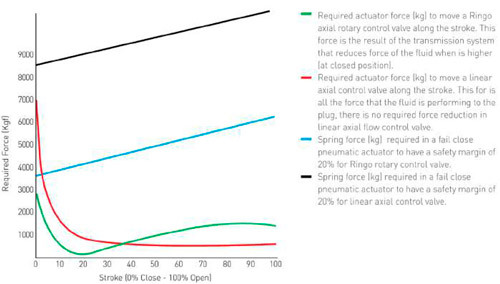 It can be seen in the graph the comparison of a linear to linear axial flow control valve versus the Ringo linear to rotary axial flow control valve. Fluid required force at closing position can be several times higher than in all other stroke points. The rotary axial flow valve from Ringo provides force required reduction at closing position, which is when more is needed. With the consequence of a reduced actuator size for the same process conditions. Standard 90o rotary, pneumatic or electric actuator of any manufac- turer can be used. Hysteresis reduced due to perfect adjustment in mechanism (minimum clearance). Reduced fugitive emissions, due to the benefits of a rotary stem versus linear stem. Excellent behavior in dirty fluids. Stem guided design allows increasing the gap between cage and plug when media includes particles. In addition, all the connections between their components are protected against particles. We have a complete range of characterized cages to cope with the problems resulting from high pressure drop applications. Selection of proper internals type allows cavitation supression as well as noise reduction. 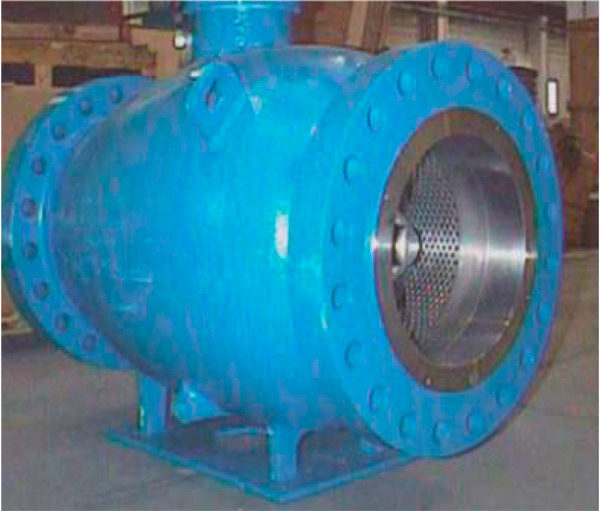 Large valve capacity and increased rangeability cages permit the use of one single valve for all process conditions. 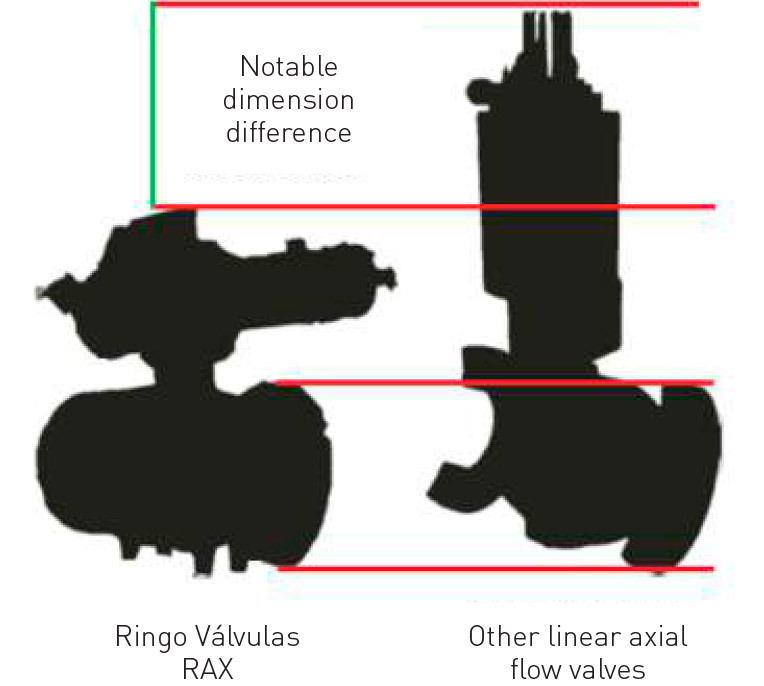 Largest flow capacity of axial valves in the market. As example a 16” 600# valve has been tested to give a Cv value of 12.445, compared with 9.325 and lower values of other manufacturers for the same size and pressure class. Therefore we can achieve either smaller size valves or lower pressure drop. As an alternative a reduced travel will allow smaller actuator and shorter operating time. A variety of single or multiple cages are available to cope with the most stringent requirements in critical applications, such as suppressing cavitation or reducing noise. Extensive experience in the manufacture of heavy duty control valves has been successfully applied to axial control valves. Linear, equal percent or other characteristic on request, standard or low noise, single double and multiple stage cages or discs, giving recovery factors (FL) as high as 0,99 to cope with the most critical service conditions. Multi-hole cage for non-critical services with regulation purposes. Combination of LDB at low strokes and STD at large strokes in order to increase valve rangeability. 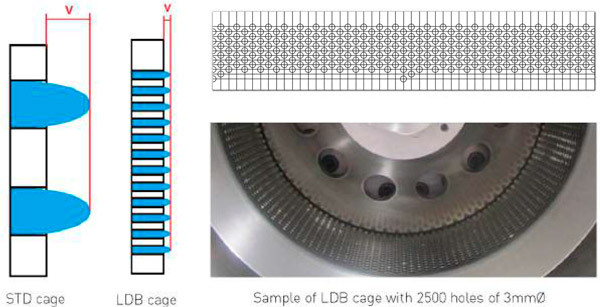 Combination of two LDB cage with small expansion area in between, in order to ensure the maximum anti-noise protection by multi-stage effect. More than 2 stages (up to 4 can also be provided for special services with high critical noise levels if requested).